Figure 10.7 9-mm cast bullet showing circular mark on base resulting from sprue. to the same diameter as the gun barrel. 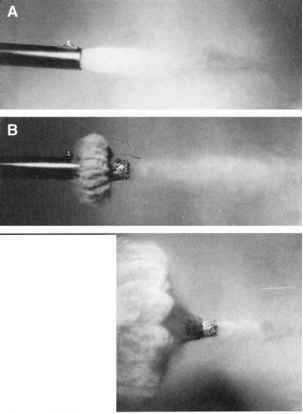 The sabot is discarded as the projectile leaves the bore of the weapon. The U.S. Army experimented with sabot-flechette rifle ammunition as well as a 5.56-mm cartridge loaded with a 4.32-mm bullet in a 5.56-mm sabot. Sabot shotgun slug ammunition that uses a plastic sheath to bring the diameter of the projectile up to the desired gauge is currently manufactured. It is discussed in detail in Chapter 8.